Cytokines and chemokines control hematopoietic stem and progenitor cell (HPC) proliferation and trafficking. However, the role of nonpeptide mediators in the bone marrow microenvironment has remained elusive. Particularly CysLT1, a G protein-coupled receptor recognizing inflammatory mediators of the cysteinyl leukotriene family, is highly expressed in HPCs. We therefore analyzed the effects of its ligands on human CD34+ HPCs. The most potent CysLT1 ligand, LTD4, rapidly and significantly up-regulated α4β1 and α5β1 integrin-dependent adhesion of both primitive and committed HPC. LTD4-triggered adhesion was inhibited by specific CysLT1 antagonists. The effects of other CysLT1 ligands were weak (LTC4) or absent (LTE4). In serum-free liquid cultures supplemented with various hematopoietic cytokines including IL-3, only LTD4 significantly augmented the expansion of HPCs in a dose-dependent manner comparable to that of peptide growth factors. LTC4 and LTE4 were less effective. In CD34+ cell lines and primary HPCs, LTD4 induced phosphorylation of p44/42 ERK/MAPK and focal adhesion kinase-related tyrosine kinase Pyk2, which is linked to integrin activation. Bone marrow stromal cells produced biologically significant amounts of cysteinyl leukotrienes only when hematopoietic cells were absent, suggesting a regulatory feedback mechanism in the hematopoietic microenvironment. In contrast to antagonists of the homing-related G protein-coupled receptor CXCR4, administration of a CysLT1 antagonist failed to induce human CD34+ HPC mobilization in vivo. Our results suggest that cysteinyl leukotriene may contribute to HPC retention and proliferation only when cysteinyl leukotriene levels are increased either systemically during inflammation or locally during marrow aplasia. Homing of hematopoietic stem and progenitor cells (HPCs)3 to the bone marrow and their subsequent retention and survival in the hematopoietic microenvironment are regulated by particular proteins and peptides (cytokines, chemokines, and adhesion molecules) (1, 2, 3). However, the role of lipid mediators such as leukotrienes (LTs) in HPC homeostasis has remained elusive, in contrast to their well-characterized involvement in allergy and inflammation (4, 5, 6). In this context, it is worth mentioning that the hematopoietic microenvironment shares similarities with inflamed tissues and that the homing of HPCs resembles extravasation of mature leukocytes during inflammation. For instance, bone marrow endothelial cells (BMEC) constitutively express the adhesion molecules E-selectin, P-selectin, and VCAM-1, which are found on the endothelium of other tissues only during inflammation (7, 8, 9). It is therefore conceivable that nonpeptide mediators like LTs, which regulate leukocyte migration and function at sites of inflammation, may also affect HPCs, particularly their trafficking and proliferation in the bone marrow. Cysteinyl leukotrienes represent important lipid mediators in inflamed tissues and have recognized roles in respiratory diseases, cancer, and cardiovascular, gastrointestinal, skin, and immune disorders (10). They elicit many of their effects through seven-transmembrane G protein-coupled receptors (GPCRs) that show structural similarities to chemokine receptors such as CXCR4, which is a key receptor involved in HPC homing to the bone marrow (11, 12). To date, two GPCRs recognizing cysteinyl leukotrienes, CysLT1 and CysLT2, have been cloned and characterized (10, 12, 13, 14). They show different binding affinities for their ligands, LTD4, LTC4, and LTE4 (15). CysLT1 binds LTD4 with a 350-fold greater affinity than it does LTC4 (10). LTE4, which acts as a partial agonist, is the least active cysteinyl leukotriene (12). CysLT2, in contrast, binds LTD4 and LTC4 with equal affinity (13, 14). CysLT1 couples to pertussis toxin (PTX)-sensitive Gi/o and PTX-insensitive Gq proteins and activates signaling pathways that modulate multiple cellular activities, including proliferation and migration. The role and function of CysLT2 is not completely understood. This receptor may also activate Gi/o signaling pathways, although recent studies suggest that CysLT2 interacts with CysLT1 on the cell surface, resulting in the formation of heterodimers and eventually in the attenuation of CysLT1-mediated effects (16). We have previously shown that CysLT1 is highly expressed in CD34+ progenitor cells (17). In contrast to CXCR4, the established “homing receptor” for HPCs that is expressed much stronger in mature mononuclear cells than in CD34+ HPCs (18), CysLT1 expression appears to be more progenitor specific. Indeed, even though mature leukocytes express some CysLT1 at the mRNA and protein level (17), it does not mediate typical functions in these cells, e.g., calcium fluxes (19). 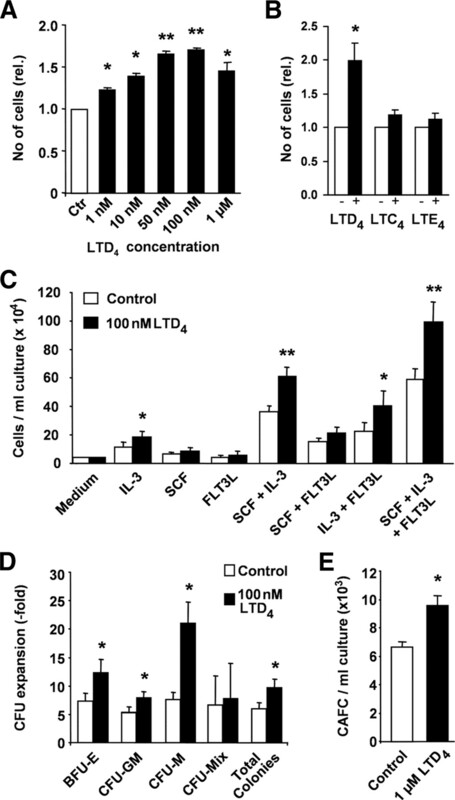 In contrast, circulating HPCs express high levels of CysLT1 and respond to LTD4 with much more pronounced calcium fluxes than those observed after stromal cell-derived factor (SDF)-1-induced CXCR4 activation (20). However, besides inducing considerable calcium fluxes and chemotaxis in vitro, the function of CysLT receptors and the potential source of their ligands in the hematopoietic system in vivo remain to be characterized. Similar to CXCR4, which plays an important role in B cell trafficking and proliferation in addition to its function as a HPC homing receptor, CysLT1 as well may regulate the function of different cell types, i.e., inflammatory effector cells and HPCs. In the present study, we analyzed the effects of cysteinyl leukotrienes on progenitor cell adhesion and proliferation in vitro as substantial cellular functions involved in the retention, survival, and differentiation of HPCs in the bone marrow microenvironment and identified potential sources of LT production in hematopoietic tissue. In analogy to studies demonstrating HPC mobilization by the CXCR4 antagonist AMD3100 (21), we evaluated the capacity of CysLT1 antagonists to induce stem cell mobilization. The LTs C4, D4, and E4 were obtained from Paesel and Lorei or Biomol. Purity and integrity of the lots were assessed by HPLC analysis. Working solutions were prepared using HPLC-grade methanol (Merck) and were kept below 0°C and under argon atmosphere at all times to avoid formation of biologically inactive isomers. The compounds MK-571, LY171883, PTX, genistein, and PD98059 were obtained from Biomol. Abs used in the adhesion assays were mAbs that have been shown to functionally block the respective adhesion molecule (22, 23) VLA-4 (CD49d, clone HP2/1; Beckman Coulter-Immunotech), VLA-5 (CD49e, clone SAM-1; Immunotech), LFA-1 (CD11a, clone TS 1/11; Endogen), β2 integrin (CD18, clone TS 1/18; Endogen), or IgG-matched isotype controls (BD Biosciences). All Abs were used at a final concentration of 12.5 μg/ml. After informed consent, peripheral blood cells were obtained from healthy donors or patients with nonhematological malignancies during G-CSF-induced stem cell mobilization according to the guidelines of the ethical committee of the University of Tübingen, Tübingen, Germany (project no. 268/2003-LP). Mononuclear cells were separated by Ficoll density gradient centrifugation. Enrichment of CD34+ cells was performed using immunomagnetic microbeads (MACS system; Miltenyi Biotec) according to the manufacturer’s instructions (purity ≥ 96%). Primary bone marrow cells were isolated after informed consent from healthy volunteers (project no. 268/2003-BM). 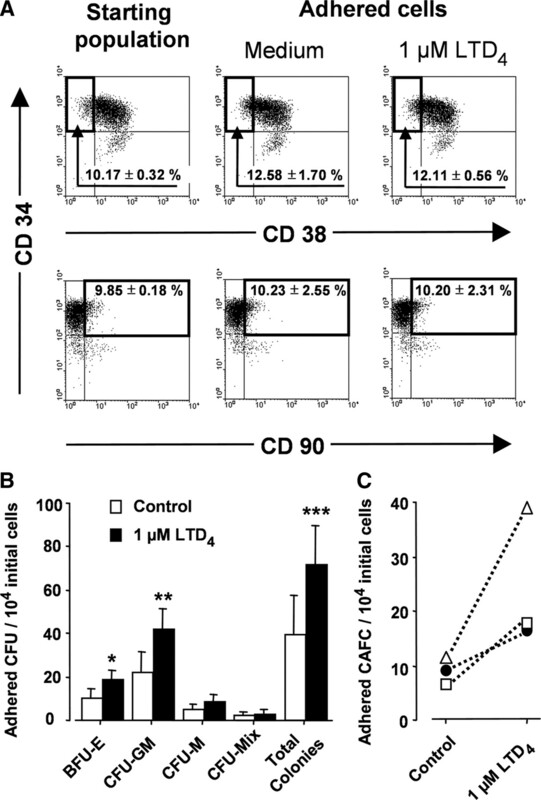 Bone marrow CD34+ cells were isolated by Ficoll separation of mononuclear cells and the subsequent enrichment of CD34+ cells by MACS as described above for peripheral blood-derived progenitors. Adherent stromal cells were isolated and cultured as previously described (17). To deplete stromal cultures of contaminating hematopoietic cells, the layers were treated with three cycles of 5 μg/ml mycophenolic acid (MPA; Sigma Aldrich), each cycle consisting of a 3-day period with MPA followed by a 4-day recovery period without MPA (24, 25, 26). Stromal cells were then washed twice with PBS and maintained for at least 1 wk in MPA-free medium (including two complete changes of medium) before using them in experiments. HUVECs (27) were grown in endothelial cell growth medium (PromoCell) plus 10% FCS. Cells were used between the fifth and eighth passage. The human microvascular BMEC line BMEC-1 (28, 29) was cultured in endothelial cell growth medium plus 10% FCS. The CD34+ CysLT1+ human acute myeloid leukemia cell lines KG-1a and Kasumi-1 as well as the CysLT1-negative T lymphoblastic cell line Jurkat were propagated in RPMI 1640 medium with 10% FCS, 100 U/ml penicillin, and 100 μg/ml streptomycin. Expression of glycophorin-A, CD14, CD15, CD34, CD38, CD41, and CD45 was evaluated by incubating 2–5 × 105 cells with the respective FITC- or PE-labeled Abs (BD Biosciences) for 20 min at 4°C and analyzed on a FACSCalibur flow cytometer equipped with CellQuestPro software. Isotype-matched IgG Abs served as negative controls. A proportion of 1% or fewer false positive events were accepted in the negative control samples throughout. To prepare HUVEC monolayers, 1 × 104 cells were seeded on gelatin-coated (0.1% in PBS), 96-well, flat-bottom tissue culture plates 48 h before the assay and grown to confluence in endothelial cell growth medium plus 10% FCS. Before adding HPCs, the monolayers were stimulated with 10 ng/ml IL-1β (Boehringer Mannheim) for 4 h. For the adhesion assays on recombinant human (rh) VCAM-1, 96-well microtiter plates were coated for 90 min at 37°C with 50 μl of a 5 μg/ml solution of carrier protein-free VCAM-1 (R&D Systems) diluted in 0.05 M bicarbonate/carbonate buffer (pH 9.6). The plate was washed with PBS to remove unbound protein, and nonspecific binding sites were blocked using a 0.1% (w/v) solution of BSA in PBS (1 h at 37°C). Before the experiment, wells were washed twice with 200 μl/well assay medium. Adhesion experiments on fibronectin were performed using BioCoat Cellware human fibronectin 96-well Multiwell plates (BD Biosciences) that were preincubated for 1 h with 100 μl/well assay medium at 37°C in 5% CO2 before adding HPCs. CD34+ progenitor cells were washed and resuspended in assay medium and held at 37°C for 3 h under gentle agitation before preincubation at 37°C with or without LTD4 for the times and concentrations indicated. To block cell adhesion, mAbs were added together with LTD4. In some experiments, cells were preincubated for 2–5 min with MK-571 (final concentration 2 μM), LY17183 (10 μM), or PTX (20 ng/ml). Cells (6 × 104 in 100 μl) were added in triplicate to the precoated plates, spun down for 15 s at 30 × g, allowed to adhere for 5 min at 37°C in 5% CO2 and then washed twice with warm assay medium to remove nonadherent cells. Bound cells were harvested with trypsin/EDTA, washed in RPMI 1640 plus 10% FCS to inactivate the trypsin, and subsequently quantified and/or characterized by flow cytometry, counted, and assessed for CFU or transferred into long-term cultures on FBMD-1 stromal feeders (see below). For quantification, recovered cells from the adhesion assays were suspended in PBS containing 0.1% BSA and stained with anti-CD34-PE. FITC-conjugated calibration beads (3 × 104) (CaliBRITE; BD Biosciences) were added, and samples were analyzed by FACS. FITC-beads were gated as G1 = R1 (where G is gate and R is region), and data acquisition was stopped after 5,000 acquired events of beads. The number of adherent cells per well was thus calculated from the ratio of HPC to beads multiplied by the number of beads added. Isolated CD34+ progenitors were seeded into 24-well cell culture plates (Costar) at an input concentration of 5 × 104 cells/ml in X-Vivo 20 containing stem cell factor, IL-3, and FLT3 ligand (100 ng/ml each; all from PeproTech) and the indicated concentrations of leukotrienes, and incubated at 37°C with 5% CO2 in a humidified atmosphere for 1 wk. Experimental setups with LTs must take into consideration that these compounds are rapidly metabolized and degraded in most systems, a process due to surface enzymes and/or enzymatic active components in the incubation medium (4). Therefore, LTs were added at days 0, 2, and 4 to allow stimulation of cells at multiple time points. At the end of the incubation period, cells were quantified in a hematocytometer. Viability was assessed by trypan blue exclusion. For further characterization of the proliferated cells, aliquots of the cell samples were labeled for flow cytometry. Additional subsets were reseeded into methylcellulose clonogenic cultures and cobblestone area-forming cell (CAFC)-assays as described below. Clonogenic progenitor assays were performed by plating equal numbers of cells (500/ml) either from the starting populations or harvested from the adhesion/proliferation assays in duplicate with MethoCult H4230 (Stem Cell Technologies). Methylcellulose medium was supplemented with rhSCF (stem cell factor), rhIL-3, rhIL-6 (20 ng/ml each; all from PeproTech), rhG-CSF (100 ng/ml; Amgen), and rhEPO (epoetin-α, 6 U/ml; Jannsen-Cilag). Colonies were counted after 14 days of culture in a humidified environment at 37°C and 5% CO2. Stromal feeders were prepared by seeding 103 FBMD-1 cells (passages 16–19) per well into fibronectin-coated 96-well plates (BioCoat Cellware) (30). Cells were grown to confluence in MyeloCult H 5100 medium (Stem Cell Technologies) supplemented with gentamicin (100 mg/l; Boehringer Mannheim) and hydrocortisone (10−6 M; Sigma Aldrich). During coculture with HPCs, the medium was additionally enriched with 10 ng/ml IL-3 and 20 ng/ml G-CSF (CAFC medium). For CAFC analysis, FBMD-1 cells were overlaid with CD34+ cells in a limiting dilution setup, with 12 dilution steps 2-fold apart and 12 replicate wells per dilution for each set of experiments. To assess the frequency of cobblestone area-initiating cells within the CD34+ populations adherent to VCAM-1, cells harvested from the adhesion assays were spun down, resuspended in equal volumes of CAFC medium, and transferred 1:1 without prior counting, i.e., the content from one well of the adhesion assay was transferred to one well in the row with the highest cell density of the CAFC assay plate. For the cells recovered from the proliferation experiments, starting input values ranged between 5000 and 8000 cells/well. Once a week half of the medium (50 μl) was replaced with fresh CAFC medium. The appearance of cobblestone areas, consisting of at least five cells, was evaluated after 5 wk with a phase contrast illumination on an inverted microscope. CAFC frequencies were calculated as single hit kinetics from the fraction of nonresponding cultures using the Poisson equation as described (30, 31). Stromal cells and confluent layers of BMEC-1 cells were washed with PBS and incubated for 18 h in serum-free medium (X-Vivo 15 without phenol red; BioWhittaker). A 1-ml aliquot of each medium sample was added to 8 ml of 90% aqueous methanol (Merck) containing 0.5 mmol/L EDTA and 1 mmol/L of the radical scavenger 4-hydroxy-2,2,6,6,-tetramethylpiperidine-1-oxyl (pH 5.6; both from Sigma-Aldrich) (32). The methanolic medium suspension was stored at −80°C for at least 24 h and then spun down at 5,000 × g for 20 min at −10°C. The supernatants were concentrated to dryness in a centrifuge under a reduced atmosphere and dissolved in 30% aqueous methanol for HPLC analysis. Immediately after collection of the conditioned medium, cells were harvested with trypsin plus EDTA and counted. Equal amounts of nonconditioned assay medium with or without known amounts of LTC4, LTD4, and LTE4 run under identical conditions were used as negative control or internal standard, respectively. To assess the effect of hematopoietic cells on LT production, stromal cultures depleted of hematopoiesis were overlaid or not with 5 × 104 bone marrow-derived CD34+ hematopoietic cells per 12.5-cm2 culture flask in 5 ml of MyeloCult H 5100 supplemented with gentamicin (100 mg/l) and hydrocortisone (10−6 M). Both stromal cells and CD34+ progenitors were isolated from the same donor source. After 4 wk of culture with a weekly semidepopulation of nonadherent cells, layers were rinsed twice with PBS and cultured for an additional 18 h in X-Vivo 15 medium without phenol red for collection of conditioned medium as described above. LT profiles were determined by combined use of HPLC and competitive enzyme immunoassay (EIA). HPLC was performed as described (32) using a Hypersil ODS column (4.6 × 100 mm, 5 μm particles; Agilent Technologies) with a Hypersil ODS precolumn (4.0 × 20 mm, 5 μm particles; Agilent) that was run at a flow rate of 1 ml/min on an Agilent 1100 system. The mobile phase consisted of methanol, water, acetic acid (65:35:0.1 by volume) and 1 mmol/l EDTA (pH 5.6; adjusted with ammonium hydroxide). Cysteinyl leukotrienes were monitored at 280 nm, and HPLC fractions containing LTC4, LTD4, and LTE4 were isolated and collected for EIA according to the retention times of known standards run under identical conditions. EIA analysis of endogenously produced leukotrienes was performed using cysteinyl leukotriene EIA kits (Cayman Chemical) according to the manufacturer’s instructions. The prior separation by HPLC allowed assessment for the amount of the respective LT metabolites within each fraction. Total RNA from BMEC-1 endothelial cells and primary human stroma samples (treated or not with MPA for three cycles as described above) was isolated using an RNeasy mini kit (Qiagen), including digestion with DNase I. First-strand cDNA was synthesized with the use of murine leukemia virus reverse transcriptase and oligo(dT)16 primers (both Applied Biosystems). Subsequent PCR analysis for 5-lipoxygenase (5-LO) and GAPDH (used as internal standard) was performed with gene-specific primers based on the human receptor sequences as follows: 5-LO, 5′-ACTGGAAACACGGCAAAAAC-3′ (forward) and 5′-GTGCAGGGGTCTGTTTTGTT-3′ (reverse; product size 501 bp); GAPDH, 5′-CGGGAAGCTTGTCATCAATGG-3′ (forward) and 5′-GGCAGTGATGGCATGGACTG-3′ (reverse; product size 358 bp). A pre-PCR heat step (5 min at 95°C) provided a PCR Hot-Start by partially activating AmpliTaq Gold DNA polymerase (Applied Biosystems). For analysis of 5-LO and GAPDH expression, 36 and 17 amplification cycles, respectively, were run, each consisting of denaturation for 15 s at 95°C, annealing for 30 s at 58°C, and elongation for 90 s at 72°C, followed by a final extension step of 10 min at 72°C. PCR products were separated by horizontal agarose gel electrophoresis with subsequent ethidium bromide staining. To detect possible contamination of genomic DNA in the RNA sample, each reaction was performed without previous reverse transcription. Primary peripheral blood CD34+ HPC and cell lines were serum starved for 3 h in X-Vivo 20 medium, resuspended at 2 × 107/ml in X-Vivo 20, and incubated with 100 nM LTD4 (final concentration) for the indicated time periods at 37°C. After stimulation, whole cell lysates were prepared in buffer containing 50 mM HEPES (pH 7.5), 10% glycerol, 1% Triton X-100, 1.5 mM MgCl2, 150 mM NaCl, protease inhibitors (Complete Mini; Roche) and the phosphatase inhibitors NaF (100 mM), Na4P2O7 (10 mM), and activated Na3VO4 (1 mM; all from Sigma-Aldrich). Equal amounts of protein (20 μg/lane) were separated on a 10% SDS-polyacrylamide gel and transferred onto nitrocellulose membrane. The blots were probed with phospho-specific polyclonal Abs against p44/42 MAPK (Thr202/Tyr204), Pyk2 (Tyr402), and AKT (Thr308) or with control Abs against the nonphosphorylated forms, respectively (all from Cell Signaling Technology). Bands were visualized with ECL (GE Healthcare). In vivo effects of the specific CysLT1 antagonist montelukast on HPC mobilization. After informed consent as approved by the ethical committee of the University of Tübingen (project number 147/2006V), blood samples for research purposes were obtained from otherwise healthy human subjects receiving treatment with montelukast (independently of the measurements described here) as a prophylaxis of exercise-induced asthma. All subjects had normal blood cell counts and normal findings from a physical examination and were taking no other medication. Patients with allergic asthma or active asthmatic disease or any other abnormal symptoms were excluded. The study design was adopted from studies with the CXCR4 antagonist AMD3100 for stem cell mobilization, which demonstrated an 8-fold increase in circulating CD34+ HPC 4 h after administration of the antagonist. In our study, venous blood samples were obtained before and at 2, 4, 8, 12, and 24 h after the first oral dose (10 mg) of the specific CysLT1 antagonist montelukast-sodium (Singulair) for analysis of the white blood count and CD34+ cell number by flow cytometry. All results are expressed as the mean ± SEM of 3–5 independent experiments, except where indicated. Data analysis was performed with SigmaStat 2.03 software (SPSS). Differences between groups were compared by Student’s t test or paired t test and considered significant at p ≤ 0.05. Preincubation with LTD4 rapidly up-regulated adhesion of HPCs to endothelium in a time- and dose-dependent manner by up to 80%, with a maximum effect in cells treated with 1 μM LTD4 for 15 min (Fig. 1⇓A). Under these conditions, 22.17 ± 2.45% of input cells adhered to HUVEC, compared with 12.53 ± 2.08% without LTD4 preincubation. Increased HPC adhesion was already detectable at LTD4 concentrations of <1 nM (Fig. 1⇓B). In contrast, LTC4 weakly up-regulated HPC adhesion to HUVEC at 1 μM, whereas addition of LTE4 did not increase adhesion at concentrations up to 1 μM (Fig. 1⇓C). LTD4-triggered adhesion of CD34+ cells to endothelium could be reduced by mAbs against α4 integrin, but not by αL and β2 integrin mAbs, indicating an effect of LTD4 on VLA-4-dependent mechanisms in this system (Fig. 1⇓D). When CD34+ cells pretreated with LTD4 under optimum conditions (1 μM/15 min) were brought in contact with the VLA-4 ligand VCAM-1 immobilized on a plastic surface, adhesion was >2-fold increased compared with that of untreated cells (Fig. 1⇓E). Adhesion could be completely blocked by the α4 integrin mAb (p < 0.001 vs isotype plus LTD4), demonstrating its specificity. The effect of LTD4 on HPC adhesion to HUVECs and VCAM-1 could be significantly blocked with the CysLT1 antagonists MK-571 (p < 0.01 vs LTD4 in Fig. 1⇓D and p < 0.05 vs isotype plus LTD4 in Fig. 1⇓E, respectively) and LY171883 (p < 0.01 vs LTD4), respectively, demonstrating the involvement of CysLT1 (Fig. 1⇓, D and E). The data also ruled out the potential participation of multidrug resistance protein 1 in LTD4-induced up-regulation of HPC adhesion, because only MK-571 but not LY171883 recognizes multidrug resistance protein 1. PTX only partially blocked LTD4-induced adhesion of HPC to HUVEC, indicating that CysLT1 signals via both PTX-sensitive (i.e., Gi) and PTX-insensitive (e.g., Gq) G proteins (Fig. 1⇓D). Adhesion of HPC to fibronectin, an extracellular matrix component serving as a β1 ligand, was also significantly increased after pretreatment with LTD4 (Fig. 1⇓E), similar to the experiments examining adhesion to endothelium or immobilized VCAM-1. Again, MK-571 abrogated the triggering effect of LTD4 (p < 0.05 vs isotype plus LTD4). Adhesion was partially inhibited by Abs against α4 integrin (p < 0.05 vs isotype plus LTD4) and α5 integrin (p < 0.05 vs isotype plus LTD4) in this model system. Considering that the already spontaneous adhesion to fibronectin is mediated by integrins, complete inhibition would result in adhesion below that of an unstimulated control and reach the value of BSA-coated wells, as observed for HPC adhesion to VCAM, which is solely mediated by α4 integrin. The data point out an effect of LTD4 not only on VLA-4 (α4β1 integrin), but also on VLA-5 (α5β1 integrin)-mediated mechanisms. Both integrins are expressed on HPCs and serve as receptors for fibronectin. LT-induced adhesion of HPCs to HUVECs, VCAM-1, and fibronectin. A, Time-dependent adhesion of HPC to HUVEC in the presence of 1 μM LTD4. Adhesion is expressed as relative adhesion (rel.) compared with the respective control (carrier solution only). ∗, p < 0.05; ∗∗, p < 0.01 vs control (Ctr). B, Dose dependence of HPC adhesion to HUVEC monolayers. CD34+ cells were incubated with the indicated concentrations of LTD4 for 15 min, followed by exposure to activated HUVECs. ∗, p < 0.05 vs control (0 M LTD4). C, Adhesion of HPC to HUVEC induced by different LTs. CD34+ cells were incubated in the presence (+) or absence (−) of LTD4, LTC4, or LTE4 (all at 1 μM) for 15 min, followed by exposure to activated HUVECs. ∗, p < 0.05 vs, control without leukotrienes. 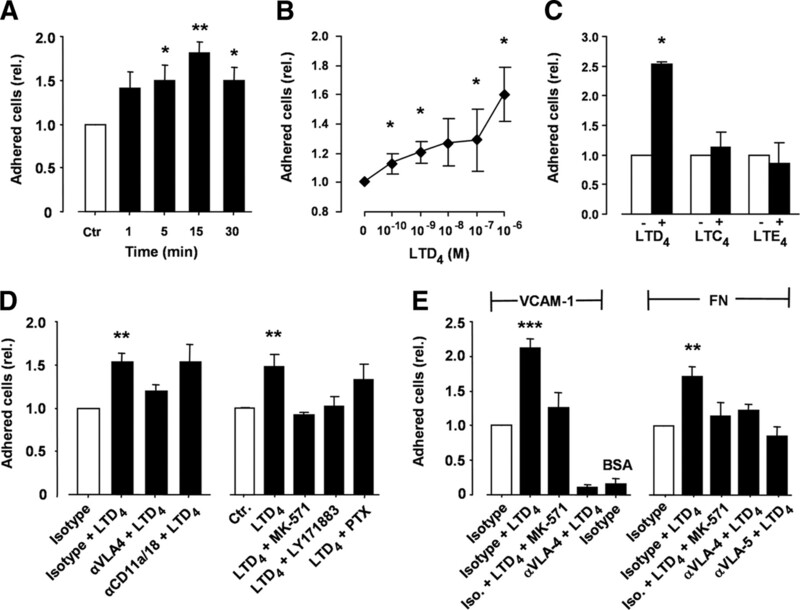 D, Effect of blocking Abs to VLA-4 and β2 integrins or receptor antagonists on LTD4-induced adhesion to HUVECs. CD34+ cells were incubated with mAb, isotype-matched IgG, CysLT1 antagonists (MK-571, LY17183), or PTX and stimulated with 1 μM LTD4 for 15 min before exposure to activated HUVECs. ∗∗, p < 0.01 vs isotype. E, LTD4-induced adhesion of HPC to VCAM-1 and fibronectin. CD34+ cells were exposed to VCAM-1 and fibronectin-coated plates after simulation with LTD4 (1 μM/15 min). The specificity of the effects was assessed with MK-571 and Abs against VLA-4 (α4) and VLA-5 (α5). Wells coated with BSA served as control for unspecific binding. ∗∗, p < 0.01; and ∗∗∗, p < 0.001 vs isotype (Iso.). HPCs harvested from the adhesion experiments on VCAM-1 were further characterized. The percentage of the more immature CD34+CD38− cells among the CD34+ progenitors that adhered to VCAM-1 in response to LTD4 was similar to that of spontaneously adhering cells and tended to be greater than the percentage of immature progenitors among the initially isolated CD34+ cells before adhesion, but the difference was not statistically significant (Fig. 2⇓A). Analogous results were seen for CD34+CD90+ cells, a subpopulation that is also enriched for more primitive progenitors, indicating that the effect of LTD4 on VLA-4-mediated adhesion was not dependent on progenitor maturation. With regard to lineage-committed progenitors, preincubation of HPCs with LTD4 (1 μM/15 min) also resulted in a significant increase in the total numbers of attached BFU-E (erythroid burst-forming unit) and CFU-GM cells as well as in the overall number of attached clonogenic cells, whereas the amount of adhered CFU-M and CFU-Mix cells was only moderately enhanced (Fig. 2⇓B). Similarly, preincubation with LTD4 consistently resulted in up-regulation of CAFC adhesion to a donor-specific extent (up to 238%; Fig. 2⇓C), which underscored that LTD4 also affected VLA-4-mediated adhesion of more primitive progenitor cells. LTD4-induced adhesion of primitive and more committed CD34+ HPCs to VCAM-1. A, HPC phenotype in the starting population and after adhesion. More primitive, immature CD34high/CD38low and CD34high/CD90+ progenitor cells (rectangular gates) were quantified in the starting population before adhesion (left), in spontaneously adhering cells (middle; Medium), and in cells adhering after stimulation with 1 μM LTD4 for 15 min (right). Data are expressed as percentage of gated events. B, Adhesion of lineage-committed HPCs (CFU). CD34+ cells were stimulated with 1 μM LTD4 for 15 min before exposure to rhVCAM. Adhering cells were harvested and plated in a semisolid colony-assay. ∗, p < 0.05; ∗∗, p < 0.01; ∗∗∗, p < 0.001 vs control, respectively. BFU-E, Erythroid burst-forming unit. C, Adhesion of primitive HPCs (CAFC). Long-term cultures on FBMD-1 stromal feeders were set up with HPC harvested from adhesion experiments on VCAM-1 by a limiting dilution setup. Data are presented as number of CAFCs per 104 initial cells brought in contact with VCAM-1 (cells from three different donors were analyzed). Analysis of cell numbers after ex vivo expansion of CD34+ HPC in serum-free, cytokine-supplemented medium for 1 wk in the presence or absence of the indicated concentrations of LTD4 demonstrated a dose-dependent effect on cell proliferation in cytokine-supplemented liquid cultures (Fig. 3⇓A). The presence of 100 nM LTD4 resulted in a 2-fold increase in the total cell number (Fig. 3⇓B). In contrast, the presence of LTC4 and LTE4 augmented HPC proliferation only weakly (18 and 12% increase, respectively), which was not statistically significant compared with proliferation without LT addition. Proliferation experiments using varying cytokine combinations revealed an effect of LTD4 on cell expansion predominantly in samples containing IL-3 (Fig. 3⇓C). After 1 wk of cytokine-supplemented liquid culture, lineage-committed and more primitive progenitors were increased in the presence of 100 nM LTD4, as demonstrated by the expansion of clonogenic progenitors (Fig. 3⇓D) and the concentration of primitive CAFCs present in the culture medium, as determined by limiting dilution analysis (Fig. 3⇓E). As CAFCs represent only a small fraction of the CD34+ progenitors with a distinct proliferation capacity, we also chose the 1 μM concentration, which was highly active in the adhesion experiments, for analysis of CAFC proliferation. LT-induced proliferation of CD34+ HPC. A, Effect of LTD4 on ex vivo expansion of HPC. CD34+ cells were cultured in cytokine-supplemented serum-free medium (control (Ctr), ∼10-fold increase after 1 wk) and compared with those additionally supplemented with the indicated concentrations of LTD4. ∗, p < 0.05; ∗∗, p < 0.01 vs control. rel., Relative adhesion (compared with control) B, LT-induced expansion of HPCs. CD34+ cells were incubated in cytokine-supplemented, serum-free medium in the presence (+) or absence (−) of 1 μM LTD4, LTC4, or LTE4, respectively, before the amount of cells was assessed. ∗, p < 0.05 vs control. C, Effect of cytokines on expansion of HPCs. The indicated cytokines were added (100 ng/ml each) in the presence or absence of 100 nM LTD4, and the cell number was assessed after 1 wk. ∗, p < 0.05; ∗∗, p < 0.01 vs control. SCF, Stem cell factor. D, Effect of LTD4 on HPC expansion of committed progenitors (CFU). HPCs before and after 1 wk of culture in cytokine-supplemented, serum-free medium with or without 100 nM LTD4 were analyzed for their clonogenic potential. Plating efficiency was assessed by plating equal numbers of cells in methylcellulose. By multiplying with the corresponding total cell number, the CFU expansion was calculated. ∗, p < 0.05 vs control. E, Effect of LTD4 on primitive 5-wk CAFCs in cytokine-supplemented liquid culture. Long-term cultures on FBMD-1 stromal feeders were set up with cells cultured for 1 wk in cytokine supplemented serum-free medium by a limiting dilution setup (12 replicate wells/condition; 12 dilution steps). ∗, p < 0.05 vs control. FACS analysis of cells expanded under the above mentioned conditions in the presence or absence of 100 nM LTD4 showed no marked differences in the expression patterns of the differentiation markers CD14, CD15, CD38, CD41, and glycophorin A, demonstrating an equal proliferative effect of LTD4 on the monocytic, granulocytic, megakaryocytic, and erythropoietic lineages (Table I⇓). To understand possible molecular mechanisms involved in the effects of LTD4 on progenitor cell adhesion and proliferation, CD34+ cells were stimulated with 100 nM LTD4 and analyzed by Western blotting for the activation of signaling molecules using phospho-specific Abs. As shown in Fig. 4⇓A, LTD4 rapidly induced the activation of p44/42 MAPK (ERK1/2) in both CD34+ cell lines as well as in the primary mobilized CD34+ HPCs, whereas LTD4 had no effect on the Jurkat T cell line that does not express CysLT1 and therefore served as a negative control. An effect of LTD4 on ERK p44/42 MAPK signaling has been reported in other cells (including differentiated epithelial and hematopoietic cells) (33, 34), but not in hematopoietic progenitor and stem cells to date. Additionally, the nonreceptor tyrosine kinase Pyk2 was phosphorylated after LTD4 treatment (Fig. 4⇓B). Pyk2 represents a homologue of the focal adhesion kinase and is involved in the integrin-signaling pathway, particularly in CD34+ hematopoietic progenitor cells that do not express the focal adhesion kinase (35). The effects of LTD4 on p44/42 MAPK and Pyk2 support our observations that LTD4 triggers not only chemotaxis (17) but also integrin-mediated adhesion and proliferation of CD34+ HPCs. Interestingly, protein kinase B (AKT), a major signal molecule that has been implicated in progenitor cell survival and proliferation (36), was less affected by LTD4 treatment under the conditions used in our studies (Fig. 4⇓C). LTD4-induced adhesion to HUVECs was significantly blocked by an inhibitor of tyrosine kinases (genistein) and by PD98059, an inhibitor of the MEK/ERK/MAPK pathway (p < 0.05 and p < 0.001 vs LTD4, respectively, shown in Fig. 4⇓D). Expansion of HPCs in the presence of hematopoietic cytokines involves MAPK and various tyrosine kinases. The effect of these inhibitors on HPC expansion was therefore not evaluated, as they completely block any proliferation in the assay systems used. LTD4-induced signal transduction in CD34+ cell lines and HPCs. A, Phosphorylation of p44/42 MAPK (P-44/42 MAPK) in cell lines and primary CD34+ HPC in response to LTD4. KG1a and Kasumi-1 were analyzed by Western blotting after stimulation with LTD4 (100 nM) for up to 20 min. Jurkat cells not expressing CysLT1 served as a negative control. Primary CD34+ cells were analyzed before (0) and after stimulation with LTD4 for 1 min. PB, Peripheral blood. B, Phosphorylation of Pyk2 (P-Pyk2) in KG1a cells and in primary CD34+ HPCs. The conditions were similar to those in the experiments described in A. C, Phosphorylation of AKT (P-AKT) in KG1a cells and in primary CD34+ HPCs. A positive control for phosphorylated AKT was added (Pos.). D, Effect of tyrosine kinase inhibitors on LTD4-induced adherence of HPCs. CD34+ cells were incubated with LTD4 (1 μM) and genistein (10 μM) or LTD4 and PD98059 (10 μM) for 15 min before exposure to activated HUVECs. ∗, p < 0.05 vs control. rel., Relative adhesion (compared with control). By RT-PCR, stromal and immortalized BMEC1 cells expressed 5-LO, which is the key enzyme of the leukotriene biosynthesis pathway (4, 37) (Fig. 5⇓A). As measured by HPLC and immunoassay (Fig. 5⇓B), biologically significant amounts of LTC4, LTD4, and LTE4 were found in the supernatants of confluent layers of these cells (Fig. 5⇓C). Summarizing all three LTs (LTC4, LTD4, and LTE4), concentrations were as high as 21.35 ± 5.25 nM (endothelium) and 18.27 ± 4.13 nM (stroma) in the culture medium, respectively. As mentioned above, significant effects on HPC proliferation in vitro were observed already at a final LTD4 concentration of 1 nM, demonstrating the physiological relevance of the data observed. Interestingly, in a conditioned medium of stromal cells not deprived of hematopoietic cells by treatment with MPA, almost no cysteinyl leukotrienes could be detected (Fig. 5⇓C). To confirm that the absence of hematopoiesis is required for LT synthesis in these cells, pure stromal layers were cocultured with bone marrow CD34+ cells (derived from the same donor source). Indeed, LT levels were reduced by 89.7–91.3% (Fig. 5⇓D). This suggests LT metabolism and/or modulation of LT production by bone marrow hematopoietic cells and supports previous findings that the quantity and profile of LTs produced both in vitro and in vivo critically depend on cellular interactions and the composition of mixed cell populations (4). 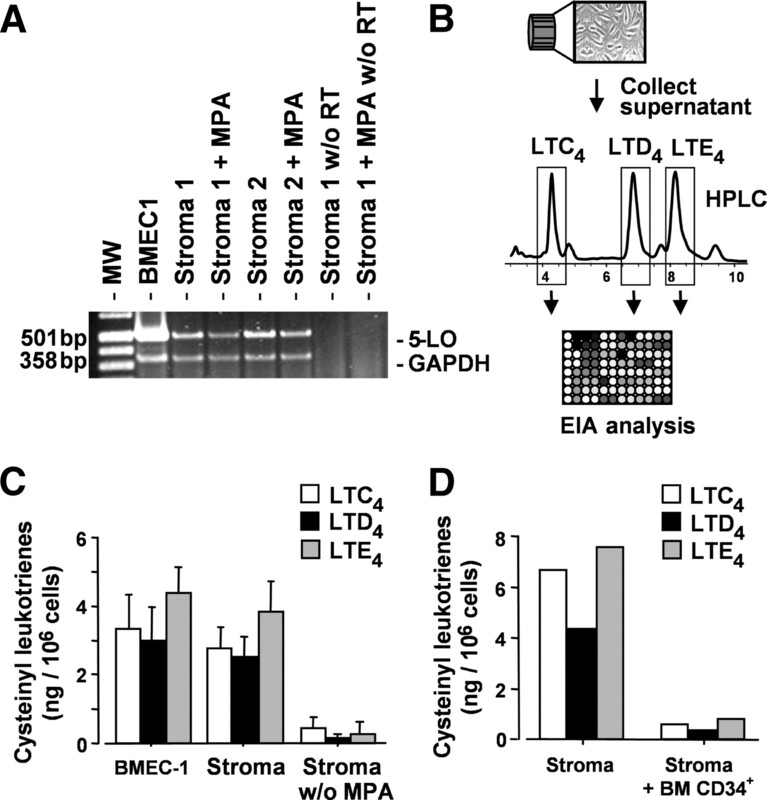 Production of cysteinyl leukotrienes by BMEC-1 and stromal cells (Stroma). A, Expression of 5-LO mRNA in BMEC-1 and primary stromal cells. RT-PCR was used for this analysis (positive control, GAPDH; negative control, absence of reverse transcriptase (w/o RT)). Complete elimination of hematopoiesis from stromal layers was achieved by MPA treatment. MW, Molecular marker. B, Experimental setup for the isolation and quantification of culture-derived cysteinyl leukotrienes. Confluent layers of primary bone marrow stromal cells or the human bone marrow endothelial cell line BMEC-1 were incubated for 18 h in serum-free medium. Fractions containing LTC4, LTD4, and LTE4 were isolated by HPLC according to the retention times of known standards and quantified by EIA. C, Production of cysteinyl leukotrienes by human BMEC-1 and primary human stromal cells. LTC4, LTD4, and LTE4 were quantified as described in B. D, Cysteinyl leukotriene production of stromal cells without and with establishment of hematopoiesis in vitro. Bone marrow (BM)-derived CD34+ cells originating from the same donor were added to a MPA-treated stromal layer and cultured for 4 wk. The amount of cysteinyl leukotrienes was analyzed as described in B and compared with the stromal cells without hematopoiesis. We investigated whether montelukast-sodium (Singulair), a selective CysLT1 antagonist used in asthma therapy, could mobilize hematopoietic progenitor cells from bone marrow to peripheral blood in human subjects with effects similar to those described for the CXCR4 antagonist AMD3100 (21). In these previous studies, an 8-fold increase of circulating CD34+ cells was observed 4 h after a single dose of the CXCR4 antagonist, suggesting that HPC mobilization is due to prevention and disruption of homing. Table II⇓ demonstrates that administration of Singulair (10 mg) had no effect on the white blood count and on the number of CD34+ HPCs in the peripheral blood at any of the time points studied. In asthmatic patients, a single dose of 10 mg of montelukast causes physiological effects (bronchodilation) within several hours after oral administration, with the mean peak plasma concentration of the drug being achieved 3 h after oral intake (38, 39). Based on this, we conclude that inhibition of CysLT1 does not result in HPC mobilization during steady-state hematopoiesis in vivo. Homing of hematopoietic progenitor cells to the bone marrow and mobilization from the marrow into the peripheral blood are multifactorial processes that are regulated at least in part at the level of the bone marrow endothelium (1, 40). The principal mechanisms involved in transendothelial migration have been elucidated in a variety of in vitro and in vivo studies, revealing a multistep process that comprises mainly selectin-mediated rolling interactions on endothelial cells followed by integrin-mediated firm adhesion after activation of progenitors with suitable stimulants (8, 41, 42, 43). Within this system, activation of cells with chemokines like SDF-1 leads to increased affinity of receptors of the β1 and β2 integrin subfamilies, with VLA-4 and VLA-5 playing predominant roles in the actual transmigration process and in subsequent HPC engraftment (2, 22). Studies addressing the factors that are able to modulate integrin-mediated HPC adhesion and transendothelial migration mainly focus on the role of the proteins and peptide compounds therein, i.e., cytokines, chemokines, and enzymes. We have shown in previous studies that the LTD4 receptor CysLT1 is expressed in human CD34+ hematopoietic progenitor cells as well as in the CD34+ cell line KG1a in a functionally active form and can trigger transmigration of CD34+ cells across bone marrow endothelial layers in an in vitro system (17). We now demonstrate that the major β1 integrins VLA-4 and VLA-5 expressed on immature human CD34+ cells can be functionally activated by the lipid mediator LTD4, leading to a significant increase in the firm adhesion of HPC to endothelial monolayers, plastic-bound VCAM-1, and fibronectin. We also show that the effect of the other cysteinyl leukotrienes (LTC4 and LTE4) on progenitor adhesion is substantially weaker or even absent, which could be explained by their much lower affinity for CysLT1. To date, up-regulation of cell adhesion as a result of LT-mediated activation of integrins had been demonstrated only for mature inflammatory leukocytes (e.g., neutrophils and eosinophils) (44, 45, 46, 47). In the present study, the effect of LTD4 on HPC adhesion to endothelial cells was time- and dose-dependent and not restricted to a particular hematopoietic progenitor lineage, because primitive, pluripotent progenitors also adhered more avidly after stimulation with the CysLT1 ligand. These observations are consistent with studies addressing the modulatory effect of chemokines like SDF-1 on integrin-mediated progenitor cell adhesion. There, the effects of SDF-1 are also rapid and transient, and both primitive and committed progenitors respond (29, 48). Considering these data, our findings suggest that LTD4 acts via similar inside-out signaling mechanisms, leading to an alteration in integrin conformation and placing the integrin in an activated state. This is confirmed by our previous observation that LTD4 acts via G protein-coupled signal transduction pathways in human CD34+ HPCs (17). The focal adhesion kinase-related protein tyrosine kinase Pyk2, which represents a key regulator of both inside-out and outside-in signaling of integrins in myeloid cells (49), was phosphorylated after activation of CysLT1 and may play a particular role in LT-induced HPC adhesion. However, not only inhibition of tyrosine kinases by genistein but also specific inhibition of the MEK/ERK/MAPK signaling pathway reduced LTD4-induced HPC adhesion. The ERK/2-dependent signaling pathways may therefore contribute not only to LTD4-mediated proliferation of HPCs in response to cysteinyl leukotrienes, but also to activation of integrin-dependent adhesion. A similar role of ERK1/2 signaling in integrin-dependent adhesion has been described in mature hematopoietic cells (e.g., eosinophils) (50). LTs have been proposed to stimulate cell proliferation in a number of different in vitro systems, including myeloid CFUs derived from mononuclear cells (51, 52). However, it remained unclear whether these effects were directly mediated by HPCs or by mature leukocytes, as unseparated cells were used. In the present study, we clearly showed that LTD4 dose-dependently triggered proliferation of CD34+ HPCs in the presence of certain cytokines, especially IL-3. Due to their lower receptor affinity, the effects of LTC4 and LTD4 were substantially weaker. There is a considerable amount of evidence that points toward interactions between lipid mediators and peptides, and above all between LTs and cytokines, including IL-3. Indeed, IL-3 and other cytokines have been shown to enhance LT production and receptor expression in vitro in various cell types (53, 54), including monocytes/macrophages (55) and HL-60 cells differentiated into eosinophils (56). Moreover, treatment of patients with IL-3 leads to an increase in the endogenous LT production (54). In reverse, LTs can affect cytokine production as shown for different interleukins and TNF (57, 58, 59). Of note, the stimulating effect of LTs on lineage-committed myeloid cells observed in earlier studies was dependent on the presence of GM-CSF (52, 60). The receptors for IL-3 and GM-CSF share a common β subunit (61) and therefore activate similar signal transduction pathways. In our study using separated CD34+ cells, the effects of cysteinyl leukotrienes on hematopoietic progenitors were most likely directly receptor mediated, but stimulation of autocrine cytokine production could also contribute to HPC proliferation. Production of lipid mediators was observed in the human bone marrow in earlier studies (60, 62, 63), but the source of cysteinyl leukotrienes and their potential function within the hematopoietic microenvironment remained unknown. We demonstrated in our study the ability of defined bone marrow components (human bone marrow stromal and endothelial cells) to synthesize LTC4, LTD4, and LTE4 in biologically significant amounts. The artificial, serum-free culture system in vitro cannot be compared with tissues in vivo. The concentrations and distribution of the cysteinyl leukotrienes may therefore be different in the bone marrow microenvironment. Moreover, in vitro leukotriene production from nonmyeloid cells could be due to contamination with leukocytes donating LTA4. Because particularly the enzyme 5-LO is largely confined to hematopoietic cells, only a few previous studies report LT biosynthesis in nonhematopoietic (i.e., endothelial and epithelial) cells (64, 65). Due to the use of a bone marrow-derived endothelial cell line to analyze leukotriene biosynthesis, transcellular synthesis of cysteinyl leukotrienes could be ruled out in our study, at least regarding the cell line BMEC-1. Indeed, we could also demonstrate 5-LO mRNA expression in the BMEC-1 cell line and bone marrow stromal cells from different donors. To minimize transcellular contribution to cysteinyl leukotriene production in our stromal cultures, cells were treated with MPA to remove hematopoiesis. Treatment of murine and human stromal layers with MPA has been demonstrated to completely eliminate colony-forming hematopoietic capacity (24, 25, 26). The presence and survival of mature mast cells or monocytes in our stromal cultures as sources of LTD4 cannot completely be excluded, but the fact that the layers were kept in culture for several weeks before analysis of leukotriene production renders this possibility rather unlikely. The observation that the amount of cysteinyl leukotrienes was not increased but in contrast drastically reduced in coculture of stroma with hematopoietic progenitors also argues against the remaining hematopoietic cells as a source of LT production. Because functional primary bone marrow stroma contains a variety of cell types including adipocytes (66), it seems reasonable that several nonhematopoietic cell types might participate in LT production in these cultures. The fact that hematopoietic cells down-regulated the amount of LTs present in culture supernatants further underlines a potential role of cysteinyl leukotrienes as paracrine mediators within the hematopoietic microenvironment. In analogy to the chemokine SDF-1, LTs might be produced by components of the bone marrow microenvironment, resulting in the adhesion of HPCs to the bone marrow endothelium and the subsequent chemotactic migration toward stromal niches, here interacting with the LT metabolism. Lack of hematopoietic activity (bone marrow aplasia) could therefore result in an increase in the amount of LTs produced by stromal and/or endothelial cells within the bone marrow, thus triggering adhesion, homing, and proliferation of hematopoietic progenitors, which represents a negative feedback mechanism. In addition, inflammation is often present during aplasia, which can lead to systemic levels of inflammatory mediators such as cysteinyl leukotrienes and further support activation of the CysLT1 expressed on HPC. During steady-state hematopoiesis, however, the local and systemic cysteinyl leukotriene level may be low without a significant contribution to progenitor cell function. This could explain the observation that treatment with a CysLT1 antagonist did not result in progenitor cell mobilization, in contrast to the CXCR4 antagonist AMD3100, which induced an substantial increase in the number of circulating CD34+ HPCs several hours after administration (21). LTs are not the only lipid mediators that act via GPCR expressed on HPC. The fatty acid anandamide, which is the natural ligand for the peripheral cannabinoid receptor, has been shown to act as a growth factor for hematopoietic cells (67). Moreover, in murine bone marrow cultures the migratory behavior of hematopoietic progenitors depends on the phospholipid sphingosine 1-phosphate (S1P) (68). In accordance, we were able to demonstrate expression of S1P receptors (S1PRs) in human HPC and found that modulation of S1PR activity leads to an increase in the bone marrow homing of primitive CD34+CD38− HPCs both in vitro and in vivo by up-regulation of CXCR4-mediated effects (69). Taken together, in addition to cytokines and other peptide compounds, cysteinyl leukotrienes and other lipid mediators are likely to play specific roles in the crosstalk between HPC and other components of the bone marrow microenvironment, modulating HPC retention, proliferation, and trafficking. We thank Christine Zimmermann for excellent technical assistance as well as Hans-Jörg Bühring and Michael Schumm for carefully reading the manuscript. ↵1 This work was supported by Deutsche Forschungsgemeinschaft Grant SFB 510/A4 and Deutsche José Carreras Leukämiestiftung Grants DJCLS R04/13 and R08/24v. ↵3 Abbreviations used in this paper: HPC, hematopoietic stem and progenitor cell; BMEC, bone marrow endothelial cell; CAFC, cobblestone area-forming cell; EIA, enzyme immunoassay; GPCR, G protein-coupled receptor; 5-LO, 5-lipoxygenase; LT, leukotriene; MPA, mycophenolic acid; PTX, pertussis toxin; rh, recombinant human; SDF, stromal cell-derived factor. Lapidot, T., I. Petit. 2002. Current understanding of stem cell mobilization: the roles of chemokines, proteolytic enzymes, adhesion molecules, cytokines, and stromal cells. Exp. Hematol. 30: 973-981. Peled, A., O. Kollet, T. Ponomaryov, I. Petit, S. Franitza, V. Grabovsky, M. M. Slav, A. Nagler, O. Lider, R. Alon, et al 2000. The chemokine SDF-1 activates the integrins LFA-1, VLA-4, and VLA-5 on immature human CD34+ cells: role in transendothelial/stromal migration and engraftment of NOD/SCID mice. Blood 95: 3289-3296. Lataillade, J. J., D. Clay, C. Dupuy, S. Rigal, C. Jasmin, P. Bourin, M. C. Bousse-Kerdiles. 2000. Chemokine SDF-1 enhances circulating CD34+ cell proliferation in synergy with cytokines: possible role in progenitor survival. Blood 95: 756-768. Denzlinger, C.. 1996. Biology and pathophysiology of leukotrienes. Crit. Rev. Oncol. Hematol. 23: 167-223. Busse, W. W.. 1998. Leukotrienes and inflammation. Am. J. Respir. Crit. Care Med. 157: S210-S213. Christie, P. E., W. R. Henderson, Jr. 2002. Lipid inflammatory mediators: leukotrienes, prostaglandins, platelet-activating factor. Clin. Allergy Immunol. 16: 233-254. Jacobsen, K., J. Kravitz, P. W. Kincade, D. G. Osmond. 1996. Adhesion receptors on bone marrow stromal cells: in vivo expression of vascular cell adhesion molecule-1 by reticular cells and sinusoidal endothelium in normal and γ-irradiated mice. Blood 87: 73-82. Schweitzer, K. M., A. M. Dräger, P. V. van der Valk, S. F. Thijsen, A. Zevenbergen, A. P. Theijsmeijer, C. E. van der Schoot, M. M. Langenhuijsen. 1996. Constitutive expression of E-selectin and vascular cell adhesion molecule-1 on endothelial cells of hematopoietic tissues. Am. J. Pathol. 148: 165-175. Mazo, I. B., U. H. von Andrian. 1999. Adhesion and homing of blood-borne cells in bone marrow microvessels. J. Leukocyte Biol. 66: 25-32. Capra, V., M. D. Thompson, A. Sala, D. E. Cole, G. Folco, G. E. Rovati. 2007. Cysteinyl-leukotrienes and their receptors in asthma and other inflammatory diseases: critical update and emerging trends. Med. Res. Rev. 27: 469-527. Lynch, K. R., G. P. O'Neill, Q. Liu, D. S. Im, N. Sawyer, K. M. Metters, N. Coulombe, M. Abramovitz, D. J. Figueroa, Z. Zeng, et al 1999. Characterization of the human cysteinyl leukotriene CysLT1 receptor. Nature 399: 789-793. Sarau, H. M., R. S. Ames, J. Chambers, C. Ellis, N. Elshourbagy, J. J. Foley, D. B. Schmidt, R. M. Muccitelli, O. Jenkins, P. R. Murdock, et al 1999. Identification, molecular cloning, expression, and characterization of a cysteinyl leukotriene receptor. Mol. Pharmacol. 56: 657-663. Heise, C. E., B. F. O'Dowd, D. J. Figueroa, N. Sawyer, T. Nguyen, D. S. Im, R. Stocco, J. N. Bellefeuille, M. Abramovitz, R. Cheng, et al 2000. Characterization of the human cysteinyl leukotriene 2 receptor. J. Biol. Chem. 275: 30531-30536. Nothacker, H. P., Z. Wang, Y. Zhu, R. K. Reinscheid, S. H. Lin, O. Civelli. 2000. Molecular cloning and characterization of a second human cysteinyl leukotriene receptor: discovery of a subtype selective agonist. Mol. Pharmacol. 58: 1601-1608. Mellor, E. A., A. Maekawa, K. F. Austen, J. A. Boyce. 2001. Cysteinyl leukotriene receptor 1 is also a pyrimidinergic receptor and is expressed by human mast cells. Proc. Natl. Acad. Sci. USA 98: 7964-7969. Jiang, Y., L. A. Borrelli, Y. Kanaoka, B. J. Bacskai, J. A. Boyce. 2007. CysLT2 receptors interact with CysLT1 receptors and down-modulate cysteinyl leukotriene dependent mitogenic responses of mast cells. Blood 110: 3263-3270. Bautz, F., C. Denzlinger, L. Kanz, R. Mohle. 2001. Chemotaxis and transendothelial migration of CD34+ hematopoietic progenitor cells induced by the inflammatory mediator leukotriene D4 are mediated by the 7-transmembrane receptor CysLT1. Blood 97: 3433-3440. Möhle, R., F. Bautz, S. Rafii, M. A. Moore, W. Brugger, L. Kanz. 1998. The chemokine receptor CXCR-4 is expressed on CD34+ hematopoietic progenitors and leukemic cells and mediates transendothelial migration induced by stromal cell-derived factor-1. Blood 91: 4523-4530. Kanaoka, Y., J. A. Boyce. 2004. Cysteinyl leukotrienes and their receptors: cellular distribution and function in immune and inflammatory responses. J. Immunol. 173: 1503-1510. Xue, X., Z. Cai, G. Seitz, L. Kanz, K. C. Weisel, R. Möhle. 2007. Differential effects of G protein coupled receptors on hematopoietic progenitor cell growth depend on their signaling capacities. Ann. NY Acad. Sci. 1106: 180-189. Devine, S. M., R. Vij, M. Rettig, L. Todt, K. McGlauchlen, N. Fisher, H. Devine, D. C. Link, G. Calandra, G. Bridger, et al 2008. Rapid mobilization of functional donor hematopoietic cells without G-CSF using AMD3100, an antagonist of the CXCR4/SDF-1 interaction. Blood 112: 990-998. Yahata, T., K. Ando, T. Sato, H. Miyatake, Y. Nakamura, Y. Muguruma, S. Kato, T. Hotta. 2003. A highly sensitive strategy for SCID-repopulating cell assay by direct injection of primitive human hematopoietic cells into NOD/SCID mice bone marrow. Blood 101: 2905-2913. Mentzer, S. J., M. A. Crimmins, S. J. Burakoff, D. V. Faller. 1987. Alpha and beta subunits of the LFA-1 membrane molecule are involved in human monocyte-endothelial cell adhesion. J. Cell. Physiol. 130: 410-415. Johnson, A., K. Dorshkind. 1986. Stromal cells in myeloid and lymphoid long-term bone marrow cultures can support multiple hemopoietic lineages and modulate their production of hemopoietic growth factors. Blood 68: 1348-1354. Dorshkind, K., A. Johnson, L. Collins, G. M. Keller, R. A. Phillips. 1986. Generation of purified stromal cell cultures that support lymphoid and myeloid precursors. J. Immunol. Methods 89: 37-47. Zhang, W., G. Knieling, G. Vohwinkel, T. Martinez, R. Kuse, D. K. Hossfeld, U. Duhrsen. 1999. Origin of stroma cells in long-term bone marrow cultures from patients with acute myeloid leukemia. Ann. Hematol. 78: 305-314. Jaffe, E. A., R. L. Nachman, C. G. Becker, C. R. Minick. 1973. Culture of human endothelial cells derived from umbilical veins. Identification by morphologic and immunologic criteria. J. Clin. Invest. 52: 2745-2756. Candal, F. J., S. Rafii, J. T. Parker, E. W. Ades, B. Ferris, R. L. Nachman, K. L. Kellar. 1996. BMEC-1: a human bone marrow microvascular endothelial cell line with primary cell characteristics. Microvasc. Res. 52: 221-234. Möhle, R., M. A. Moore, R. L. Nachman, S. Rafii. 1997. Transendothelial migration of CD34+ and mature hematopoietic cells: an in vitro study using a human bone marrow endothelial cell line. Blood 89: 72-80. Breems, D. A., E. A. Blokland, S. Neben, R. E. Ploemacher. 1994. Frequency analysis of human primitive haematopoietic stem cell subsets using a cobblestone area forming cell assay. Leukemia 8: 1095-1104. Ploemacher, R. E., J. P. van der Sluijs, J. S. Voerman, N. H. Brons. 1989. An in vitro limiting-dilution assay of long-term repopulating hematopoietic stem cells in the mouse. Blood. 74: 2755-2763. Denzlinger, C., C. Haberl, W. Wilmanns. 1995. Cysteinyl leukotriene production in anaphylactic reactions. Int. Arch. Allergy Immunol. 108: 158-164. Capra, V., S. Ravasi, M. R. Accomazzo, M. Parenti, G. E. Rovati. 2004. CysLT1 signal transduction in differentiated U937 cells involves the activation of the small GTP-binding protein Ras. Biochem. Pharmacol. 67: 1569-1577. Recher, C., L. Ysebaert, O. Beyne-Rauzy, V. Mansat-De Mas, J. B. Ruidavets, P. Cariven, C. Demur, B. Payrastre, G. Laurent, C. Racaud-Sultan. 2004. Expression of focal adhesion kinase in acute myeloid leukemia is associated with enhanced blast migration, increased cellularity, and poor prognosis. Cancer Res. 64: 3191-3197. Lee, Y., A. Gotoh, H. J. Kwon, M. You, L. Kohli, C. Mantel, S. Cooper, G. Hangoc, K. Miyazawa, K. Ohyashiki, H. E. Broxmeyer. 2002. Enhancement of intracellular signaling associated with hematopoietic progenitor cell survival in response to SDF-1/CXCL12 in synergy with other cytokines. Blood 99: 4307-4317. Funk, C. D.. 2001. Prostaglandins and leukotrienes: advances in eicosanoid biology. Science 294: 1871-1875. Lipworth, B. J.. 1999. Leukotriene-receptor antagonists. Lancet 353: 57-62. Balani, S. K., X. Xu, V. Pratha, M. A. Koss, R. D. Amin, C. Dufresne, R. R. Miller, B. H. Arison, G. A. Doss, M. Chiba, et al 1997. Metabolic profiles of montelukast sodium (Singulair), a potent cysteinyl leukotriene1 receptor antagonist, in human plasma and bile. Drug Metab. Dispos. 25: 1282-1287. Möhle, R., F. Bautz, S. Rafii, M. A. Moore, W. Brugger, L. Kanz. 1999. Regulation of transendothelial migration of hematopoietic progenitor cells. Ann. NY Acad. Sci. 872: 176-185. Frenette, P. S., S. Subbarao, I. B. Mazo, U. H. von Andrian, D. D. Wagner. 1998. Endothelial selectins and vascular cell adhesion molecule-1 promote hematopoietic progenitor homing to bone marrow. Proc. Natl. Acad. Sci. USA 95: 14423-14428. Mazo, I. B., J. C. Gutierrez-Ramos, P. S. Frenette, R. O. Hynes, D. D. Wagner, U. H. von Andrian. 1998. Hematopoietic progenitor cell rolling in bone marrow microvessels: parallel contributions by endothelial selectins and vascular cell adhesion molecule 1. J. Exp. Med. 188: 465-474.
van der Loo, J. C., X. Xiao, D. McMillin, K. Hashino, I. Kato, D. A. Williams. 1998. VLA-5 is expressed by mouse and human long-term repopulating hematopoietic cells and mediates adhesion to extracellular matrix protein fibronectin. J. Clin. Invest. 102: 1051-1061. Friedrich, E. B., A. M. Tager, E. Liu, A. Pettersson, C. Owman, L. Munn, A. D. Luster, R. E. Gerszten. 2003. Mechanisms of leukotriene B4-triggered monocyte adhesion. Arterioscler. Thromb. Vasc. Biol. 23: 1761-1767. Damtew, B., P. J. Spagnuolo. 1997. Leukotriene C4 from vascular endothelium enhances neutrophil adhesiveness. Prostaglandins Leukot. Essent. Fatty Acids 56: 111-116. Nagata, M., K. Saito, K. Tsuchiya, Y. Sakamoto. 2002. Leukotriene D4 upregulates eosinophil adhesion via the cysteinyl leukotriene 1 receptor. J. Allergy Clin. Immunol. 109: 676-680. Fregonese, L., M. Silvestri, F. Sabatini, G. A. Rossi. 2002. Cysteinyl leukotrienes induce human eosinophil locomotion and adhesion molecule expression via a CysLT1 receptor-mediated mechanism. Clin. Exp. Allergy 32: 745-750. Hidalgo, A., F. Sanz-Rodriguez, J. L. Rodriguez-Fernandez, B. Albella, C. Blaya, N. Wright, C. Cabanas, F. Prosper, J. C. Gutierrez-Ramos, J. Teixido. 2001. Chemokine stromal cell-derived factor-1α modulates VLA-4 integrin-dependent adhesion to fibronectin and VCAM-1 on bone marrow hematopoietic progenitor cells. Exp. Hematol. 29: 345-355. Miura, Y., Y. Tohyama, T. Hishita, A. Lala, E. De Nardin, Y. Yoshida, H. Yamamura, T. Uchiyama, K. Tohyama. 2000. Pyk2 and Syk participate in functional activation of granulocytic HL-60 cells in a different manner. Blood 96: 1733-1739. Zhu, X., B. Jacobs, E. Boetticher, S. Myou, A. Meliton, H. Sano, A. T. Lambertino, N. M. Munoz, A. R. Leff. 2002. IL-5-induced integrin adhesion of human eosinophils caused by ERK1/2-mediated activation of cPLA2. J. Leukocyte Biol. 72: 1046-1053. Miller, A. M., R. S. Weiner, V. A. Ziboh. 1986. Evidence for the role of leukotrienes C4 and D4 as essential intermediates in CSF-stimulated human myeloid colony formation. Exp. Hematol. 14: 760-765. Stenke, L., M. Mansour, P. Reizenstein, J. A. Lindgren. 1993. Stimulation of human myelopoiesis by leukotrienes B4 and C4: interactions with granulocyte-macrophage colony-stimulating factor. Blood 81: 352-356. Murakami, M., K. F. Austen, C. O. Bingham, III, D. S. Friend, J. F. Penrose, J. P. Arm. 1995. Interleukin-3 regulates development of the 5-lipoxygenase/leukotriene C4 synthase pathway in mouse mast cells. J. Biol. Chem. 270: 22653-22656. Denzlinger, C., J. Walther, W. Wilmanns, H. H. Gerhartz. 1993. Interleukin-3 enhances the endogenous leukotriene production. Blood 81: 2466-2468. Thivierge, M., J. Stankova, M. Rola-Pleszczynski. 2001. IL-13 and IL-4 up-regulate cysteinyl leukotriene 1 receptor expression in human monocytes and macrophages. J. Immunol. 167: 2855-2860. Thivierge, M., M. Doty, J. Johnson, J. Stankova, M. Rola-Pleszczynski. 2000. IL-5 up-regulates cysteinyl leukotriene 1 receptor expression in HL-60 cells differentiated into eosinophils. J. Immunol. 165: 5221-5226. Mellor, E. A., K. F. Austen, J. A. Boyce. 2002. Cysteinyl leukotrienes and uridine diphosphate induce cytokine generation by human mast cells through an interleukin 4-regulated pathway that is inhibited by leukotriene receptor antagonists. J. Exp. Med. 195: 583-592. Rola-Pleszczynski, M., J. Stankova. 1992. Leukotriene B4 enhances interleukin-6 (IL-6) production and IL-6 messenger RNA accumulation in human monocytes in vitro: transcriptional and posttranscriptional mechanisms. Blood. 80: 1004-1011. Gagnon, L., L. G. Filion, C. Dubois, M. Rola-Pleszczynski. 1989. Leukotrienes and macrophage activation: augmented cytotoxic activity and enhanced interleukin 1, tumor necrosis factor and hydrogen peroxide production. Agents Actions 26: 141-147. Lindgren, J. A., L. Stenke, M. Mansour, C. Edenius, L. Lauren, B. Nasman-Glaser, I. Ericsson, P. Reizenstein. 1993. Formation and effects of leukotrienes and lipoxins in human bone marrow. J. Lipid Mediat. 6: 313-320. Martinez-Moczygemba, M., D. P. Huston. 2003. Biology of common β receptor-signaling cytokines: IL-3, IL-5, and GM-CSF. J. Allergy Clin. Immunol. 112: 653-665. Stenke, L., L. Lauren, P. Reizenstein, J. A. Lindgren. 1987. Leukotriene production by fresh human bone marrow cells: evidence of altered lipoxygenase activity in chronic myelocytic leukemia. Exp. Hematol. 15: 203-207. Stenke, L., M. Mansour, C. Edenius, P. Reizenstein, J. A. Lindgren. 1991. Formation and proliferative effects of lipoxins in human bone marrow. Biochem. Biophys. Res. Commun. 180: 255-261. Zhang, Y. Y., J. L. Walker, A. Huang, J. F. Keaney, C. B. Clish, C. N. Serhan, J. Loscalzo. 2002. Expression of 5-lipoxygenase in pulmonary artery endothelial cells. Biochem. J. 361: 267-276. Luo, M., S. Lee, T. G. Brock. 2003. Leukotriene synthesis by epithelial cells. Histol. Histopathol. 18: 587-595. Fuchs, E., T. Tumbar, G. Guasch. 2004. Socializing with the neighbors: stem cells and their niche. Cell 116: 769-778. Valk, P., S. Verbakel, Y. Vankan, S. Hol, S. Mancham, R. Ploemacher, A. Mayen, B. Lowenberg, R. Delwel. 1997. Anandamide, a natural ligand for the peripheral cannabinoid receptor is a novel synergistic growth factor for hematopoietic cells. Blood 90: 1448-1457. Yanai, N., N. Matsui, T. Furusawa, T. Okubo, M. Obinata. 2000. Sphingosine-1-phosphate and lysophosphatidic acid trigger invasion of primitive hematopoietic cells into stromal cell layers. Blood 96: 139-144. Kimura, T., A. M. Boehmler, G. Seitz, S. Kuci, T. Wiesner, V. Brinkmann, L. Kanz, R. Möhle. 2004. The sphingosine 1-phosphate receptor agonist FTY720 supports CXCR4-dependent migration and bone marrow homing of human CD34+ progenitor cells. Blood 103: 4478-4486.